Repertoire and Reviews - Ashton Singers is a chamber choir based in Winchester, Hampshire. with Pat Glynn, lute, guitar; Jenny Oborn, Adrian Neville, guitar. Johann Sebastian Bach (1685-1750): In Dulci Jubilo, Trio, Gavotte (guitar trio). Prélude, Courante, Menuett I, Menuett II, Gigue. Gloria, Sanctus, Benedictus, Agnus Dei. Jane Sherriff - soprano, Peter Fellows - tenor, Pat Glynn - lute. Luys de Narvaez (fl. 1525-49): Differencias sobre "Guardame Las Vacas"
Not a membership enquiry, just a tiny thank you-I happened to be visiting St Cross Hospital yesterday just as you started rehearsing the Harris and Parry - it was so beautifully, sensitively sung I just wanted to say thank you for a magical moment. I’m one of the classical/opera critics at the Spectator, Independent etc and had come to the end of a long week of music, but that was a real high point - an unexpected gift on a rainy afternoon. The magical combination of the Ashton Singers with leading period instrument ensemble Canzona, performed to a very full St. Cross Chapel a brilliantly designed programme of early 17th century works associated with Venice. Everything was delivered with real conviction and obvious affection for the music; nothing was lost in diction or tuning. This enthralling programme guaranteed a totally pleasurable finale this year’s Winchester Festival. Hampshire Chronicle review of St.Cross Church, Winchester concert, with Canzona. July 2015. -The music and singing were fabulous. Such professionalism, polish and attention to detail! 'Ashton Singers captured the mood perfectly in Cathedral', displaying their long-standing rapport with early music. Well balanced voices, nuanced dynamics and phrasing gave complete stylistic integrity to a skilfully conceived programme. The five soloists from the choir were totally professional in projection, clarity, intonation and authentic ornamentation. Hampshire Chronicle review of performance in Winchester Cathedral of Buxtehude ‘Membra Jesu nostri’, with The Rose Consort of Viols. March 2015. -It was divine! It happens to be a period I am especially fond of and I was not disappointed. .the Ashton Singers provided music of tremendous range and variety, mixing old and new, well known and unfamiliar. They delivered a well-judged and well prepared Festival programme appreciated by a large and discerning audience. ..the very large audience was able to savour the perfect ensemble of the Ashton Singers. Their phrasing and dynamic nuances are impeccable and their response to the music’s stylistic demands is always tasteful and authentic. This was music-making of the highest order with the singers alert to each other and at one with their director. It was a total joy to hear you all on Saturday evening at St Cross's Hospital concert. Thank you for a glorious evening. I look hugely forward to your next performance. Written communication from a member of the audience, St Cross concert, July 2013. Thank you for a wonderful Ashton Singers concert last Saturday in Winchester Cathedral. The beauty of the singing matched the glory of the setting, and the whole effect was ravishing. It was a special evening! The duet brought tears to the eyes. What a beautiful concert! The whole programme was superb. The Megerle duet was wonderful - I wasn't the only one reduced to tears; the fabulously self-flagellating Gesualdo, and then the MacMillan ... the truly Scottish drone, the desolation, the plainsong moving between the different voice parts, and the final serenity - so challenging, but a challenge so well met and utterly memorable. A beautifully controlled rendition of an antiphonal chant by the 12th century mystic Hildegard von Bingen gave a magical opening to a concert that led us from monastically-inspired pieces to the polychoral peaks of the 17th century and onwards to the English ‘Renaissance’ of Parry, Stanford and Elgar, ending with the choral complexities of Gabriel Jackson and Paul Mealor. Purity of tone, firm intonation and a tightly polished, well-balanced ensemble were the hallmarks of the evening. The Baroque pieces were served with a rich, full sound combined with a strong rhythmic sense, so important in this double choir repertoire. Blend and unanimity were impressive throughout, both in the full climaxes and in the more restrained passages. The performance expressed both the tension and the passion of Victoria’s music. Once again the Ashtons offered their audience fine music, spiced with some rarities, sung with commitment and great musicality. Ashtons at their best: unanimous, clear-textured, responsive to the nuances of the words and the music. Ashton Singers have established themselves under their conductor Julian Macey as a group to listen to. They explore interesting repertoire, and once again their audience with have been delighted with what it heard. Your concert in St Cross was absolutely wonderful. I think I enjoy it more every year! A perfect way to enjoy a summer’s evening! We want to say how much we enjoyed the St Cross concert. The Ashton Singers were magnificent, as always. The whole evening was vintage Winchester! I was deeply moved by the quality of the Ashton Singers concert in St Cross. Everything was special: the voices, the venue, the choice of music, the balance, the pitch – I could go on and on ....not only an interesting event but also a deeply moving spiritual experience. The Ashton Singers sang with lovely tone, vitality and commitment to the words, a performance of real beauty. ‘For he shall give his angels’ and ‘Lift thine eyes’ were highlights of the evening and the final quartet was outstanding. I’m sure you will have many singers wanting to join you. Music by Tallis in the first half revealed the admirable tone quality which this choir consistently produces....support of the interweaving lines had splendid control and when the voices came together a rich blend always pertained. The second half showed the choir’s ability to associate with works of a very different style. Balance between parts was excellent and all had considerable beauty and dignity with blocks of sound highly effective. ..to find so capable and musicianly a choir is more than any cathedral has the right to hope for. We are most grateful. The very high standards we have come to expect of the Ashton Singers were once again in evidence. ....the precision and confidence of attack never failed, even when entries were by just a few voices.... the singing never lacked the inner vitality which maintains the interest of the listener. Throughout, there was a perfect blend of lines and textures within the parts, with overall homogeneity of tone devoid of any dominance of individual voices. Thank you so much for the wonderful contribution made by the Ashton Singers to our 1549 Mass...the music truly supported the Liturgy..and this was entirely due to the sensitive way in which the Ashton Singers performed. The music seemed to waft in gently like the incense, which everyone, with the exception of the thurifier, coped with admirably. The pyrotechnic display in the chancel will live long in the memory! One associates the Ashton Singers primarily with unaccompanied music of an earlier period. But a 20th century programme, including works which few choirs could hope to tackle, brought performances of the highest possible standards in a concert. Not only was there excellent choral balance and total security throughout, but the expressive hands of conductor Julian Macey elicited the fluid tempi and subtle dynamic gradations which so much of it required....Schoenberg’s highly challenging Friede auf Erden is intensely chromatic but the considerable difficulties it poses were surmounted with confident aplomb. 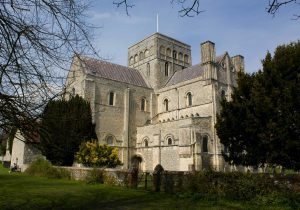 ...it was certainly one of the finest offerings made by a local choir that I’ve heard in my twelve years in Winchester...the singers were remarkably relaxed in a very demanding programme...this helped to produce a wonderfully free, unrestricted tone. The balance as well as the blend was impressive...such an imaginative programme, beautifully balanced in pace and style. The delicate nuances in the smoothly flowing intertwining strands were wonderfully controlled, while the perfect blend within a part remained constant at all dynamic levels. Even when the voices were singing in eight parts, the security of entries never faltered. Robert White’s Lamentations was the main work in the first half. In St. Luke’s ideally suited acoustic, I did not want this endless stream of glorious sound to cease - the choir and conductor working as one, performing this music to a standard rarely likely to be bettered. The real highlight was a brilliant performance of Jonathan Harvey’s I love the Lord...How well this was performed – the clarity of the top B from the soprano soloist, the angular vocal lines from both the alto and soprano soloists, and above all else the sheer tension created between soloists and choir lead to a totally convincing performance. The recital ended with Bach’s monumental Singet dem Herrn, a supreme test of choral expertise, but here holding no terrors for the singers. It was a bravura performance, meticulously directed by Julian Macey. Brian Longthorne, Hampshire Chronicle, July 1993. The control of the polyphonic lines was as excellent as the blend of voice within a part. Economy of gesture ensured that there was no distraction from the profound effect made by this solemn music, but Julian Macey’s skilful guidance still ensured beautiful gradations of nuance...towards the points of climax. The singing of early music has become something of a fashion, with a profusion of professional groups now in demand – Tallis Scholars, The Sixteen etc. It was gratifying therefore to hear an amateur choir by no means eclipsed by such big guns of the early music scene...many professional choirs are made up of singers who are soloists in their own right and have a corresponding vocal projection...which is inappropriate to the early choral style. The Ashtons, by contrast performed with an overall blend of tone and dynamic that made for singing of the highest quality and brought moments of great beauty. Many thanks to you and all the Ashton Singers for coming last Sunday and singing marvellously: yes, that was the word used to me in respect of both services. A very big thank you to you and all for your singing, which once again earned golden opinions.